Ann Marie Amiotte has loved Red Cloud since she herself was a high school student here. 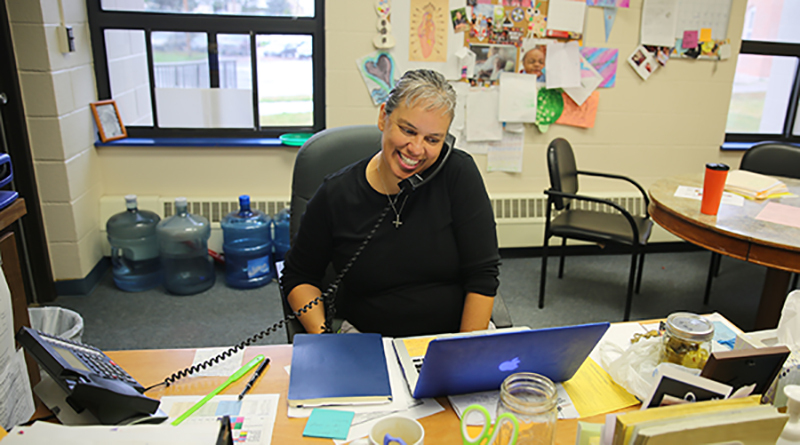 And after more than a decade serving as assistant principal and dean of students, she is now taking the reins as the elementary school principal. Here, she shares what she's looking forward to the most in this new role: empowering students to find their own voices, follow their own dreams, and celebrate their Lakota identity. You attended Red Cloud during high school. What do you remember most--and what impact did being a Red Cloud student have on you? Before I got to Red Cloud, and this is the honest to goodness truth, I never liked school. It was always really difficult for me. There wasn't anything traumatic that happened to make me feel that way--I was a good student, I was a good athlete, I had good grades. But I just hated school, until I came here. As soon as I got to Red Cloud, I started to see and understand how all the other students loved school. The kids were so amazing and funny--and rather than having separate cliques, I felt like all of the kids knew and liked each other. There was such a sense of community among the students. And then, of course, there were wonderful teachers. What I appreciated about the teachers and volunteers was their sincere presence and genuine relationships with students. It really didn't feel like there was any divide between teachers and students. There was truly a sense of family that was really nurturing--and I just loved it. You've been at Red Cloud as an educator and administrator for well over a decade--what roles have you played over the years? I started out as a K-4 religion teacher and did that for about a year and a half. But I realized I wasn't meant to be a teacher. I was getting crabby with the kids--and I had enough sense to know it wasn't them, it was me! I decided to leave, but soon after, I was asked to come back and apply to be assistant principal. Ultimately, my position became dean of students--but essentially, I've been in that administrative support role for the last 11 years. Most of my time is just spend being with the students--being in the classrooms or wherever they are, just being in their presence and making sure everything is going okay. Getting to be with our students all day--and with our wonderful teachers--is really a gift. Through your time here, what's been most rewarding? I really love that, in my position, I get to know every single student and most all of their families. Through that process, you get to know who each student is, what their family life is like, what struggles they have, what joys they have. In this role, you are able to walk side-by-side with our students and parents, often through the more difficult times, helping them to figure out how we can fix and address challenges--how we can learn to succeed and overcome them. It's incredibly rewarding. You're now taking on this new role as elementary school principal. What are your hopes for this next step? My philosophy is that our teachers and students are really the ones doing all the work. So as an administrator, I think it's really important to not get in the way and trust your teachers and follow their lead and try to support them as much as possible. The best schools have teachers that are valued and utilized and listened to. My motto is going to be--what is the best choice for the student? That's what we want to base all our decisions on. What I'm looking forward to doing is really elevating student voices in our school. I really want to collaborate with our studens, to give them that leadership ability--the ability to advocate for themselves and take responsibility for their behaviors and their successes. Often, we default to us just telling the kids what to do. I want to listen more to their voices and perspectives. To have them share and express what they feel is the best choice for them. What makes a Red Cloud education uniquely powerful? I really enjoy the aspect that we're a Lakota Catholic school, and so prayer and talk of God and spirit is normal, natural, consistent, and daily. It's such an important part of what we do--connecting students to their spirit. Because that's where you find the resources to perserve, to mourn, and to hope and to dream. Every conversation we have with them can be framed in terms of spirit. So, when I have to discipline a student, or when a student is struggling or having a bad day, it's not unusual for me to start with a prayer, and to say, "first we're going to smudge and prayer and get rid of the bad stuff." Those are all tools we can use--and then kids begin to see that you can approach life's problems or sorrows or traumas or challenges that way. It's about being really intentional and consistent with making our classrooms and environments more culturally relevant. We're so fortunate to have the Lakota immersion program (through a partnership with Thunder Valley Community Development Corporation) in our building--and that is really bleeding into our more dominant classrooms as well. We're exploring how to integrate Lakota language and Lakota practice and prayer into all that we do. And that has a powerful impact on our students. Want to receive more stories like this?